"What do you do about thin, weak, lifeless, muffled/hooty, nasal, monotone and and edgy voices?" They all have one thing in common- the "resonance cave" of the voice is not completely open. These vocal sounds are not nearly as "listenable" as rich, clear, bell-like, multi-textured musical sounds of voice when the throat is open. Sometimes a person is so used to speaking or singing with a compromised voice they don't even know it's possible to change it. But with vocal training to open the throat, you will be amazed at how great you can sound. The "resonance cave" of the voice involves a forked channel. The channel goes from the larynx in the throat upwards where it forks into the mouth and the nasal and sinus passages. The nose is actually huge inside. The top of the nasal membrane goes all the way up to the eyes. The vocal cords vibrate the larynx. Sound waves coming off the larynx go through the channel to bounce against other tissue surfaces and cavities in the throat, mouth, nose and some sources say even down the trachea. These alternative resonation zones add their own character to the sound waves. If the channel is open, more vibrations can reach more surfaces, and the resulting sound gathers and comes out the mouth much richer than when the channel is constricted anywhere. Another very important point is that different pitches need to vibrate through different resonation zones. If your throat is tight anywhere, that will keep vibration from freely traveling and you will experience limited range - and vocal strain if you try to hit inaccessible notes. First of all.. record yourself speaking or singing something so you have a baseline from which to assess your progress. If you have what is commonly known as a "nasal" sound, the nose is actually constricted - like when you have a cold. Paradoxically, to get away from the nasal sound, you need to sing through an open nose - not just your mouth! Try singing or speaking with a flared nose to see the difference. Another thing that can help open the nasal portion of the throat channel: Use your eyes!! Try counting to five LOUD with your eyes small and frozen. Then count again with your eyes wide moving like you're communicating to a baby. To open the throat channel where it forks into the mouth... Articulate your words in the front of your mouth... NOT AT THE JAW! You may not realize you're speaking from the jaw so try this... put your knuckle in your mouth and try to speak. Then take your knuckle out but try to speak like it's still there. Sometimes it helps to rock the jaw slightly sideways to keep from locking it on a note or passage. Try speaking or singing while imagining a ping pong ball is on the back of your tongue and you don't want to crush it. Another thing that affects the channel at the top of the throat and back of the mouth: Don't hold your head forward! Try doing wall work: Stand against a wall (head and heel against the wall, flexible spine, chin level and floating) and speak or sing. Notice and/or hear a difference? When using a mike, pull your mouth back from the mic like you're playing tug of war. Don't go too far, just a little stretch. Your head should go back and to the side a bit, and keep your chin flexibly level. 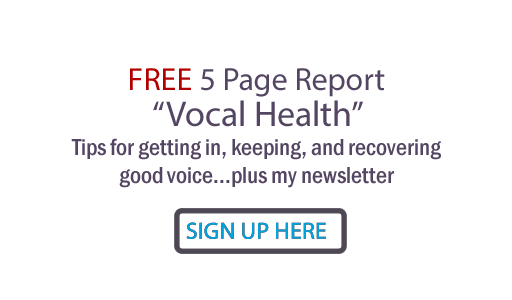 If you have my PPP vocal training cds, study the section on the "6-way inside stretch" to learn more about expanding your channel. It's important to make the stretch equidistant so as to keep the larynx from lifting or dropping, and instead allow it to float in place so it can rock back and forth slightly as it adjust vocal cord length and width. And one last point... sometimes the throat tightens to try to defend the vocal cords from too much breath pressure. That's why I emphasize the three cornerstones of Power, Path & Performance vocal training - studying breath technique along with open throat and performance communication. Put them all together and you have.... GREAT VOICE! Let me know how you do with these suggestions by clicking the comment link. Thank you Julie! This is why I write this blog- to be of PRACTICAL and EFFECTIVE use to you. Good luck and let me know how you do with these ideas... in finding you own voice!